Mabui was a kunoichi from the Village Hidden by Clouds and assistant to the Fourth Raikage. She had an unique ability to transfer items to a long distance in lightning speed. 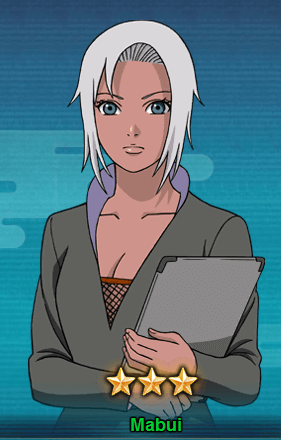 Her ability was a great help when Ay[Fourth Raikage] and Tsunade transported to the battlefield during Fourth Shinobi World War. Mabui died along with Shikaku Nara and Inoichi Yamanaka when the Ten-Tails fired Tailed Beast Ball at the HQ of Shinobi Allied Forces. Ninjutsu Ninja Art – Lightning Transmission Jutsu [Prompt]: Cause Ninjutsu damage to the selected opponent’s uni and Knockdown. If killed by this skill, the unit will not resurrect. Ninjutsu Healing Jutsu: Heals 1 unit with the least Life from your team and disperse all Debuff on him. Ninjutsu Report: Recover 40 chakra points before action. Can be triggered twice at most each round. Taijutsu Secretary Fight: Chases and Attacks a Knocked Down unit, causes Knockdown. Ninjutsu Defender of Hidden Cloud: At the beginning of a battle, generates a Shield up to 9 Lightning or Water attributes ninjas from your field based on 30% of this unit’s Resistance base attribute. You can get Mabui from the Kage Treasure. It will take almost 10 seal scrolls draw to get Mabui.